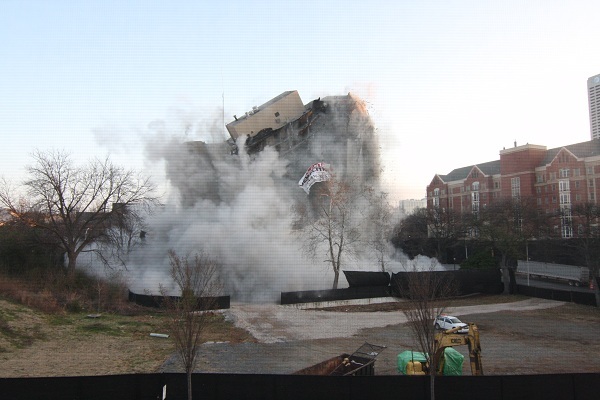 The Roosevelt House, a former Atlanta housing project located on Centennial Olympic Park Drive, was imploded on Sunday, Feb. 27, at approximately 7:30 a.m. 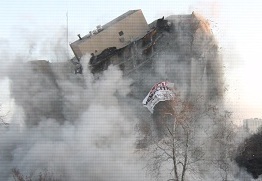 The implosion, which was supervised by Atlanta Demolition, attracted a large number of viewers. The 17-story building, which was part of the Atlanta Housing Authority (AHA), served as a public housing facility for seniors and disabled citizens. A large number of Tech students attended the main event while some East Campus residents watched from their dorm rooms and apartments. Housing e-mailed residents a list of precautions and key points about the implosion including keeping windows shut during this period. Housing also shut off the air handlers to the North Avenue buildings to prevent dust from being spread through the hallways. “It is truly amazing how the engineers can plan such a dangerous demolition so well to ensure the safety of such a densely populated area,” said Tianlin Chang, a second-year CEE. Channing Henderson, director of Asset Preservation and Enhancement from Integral Property Management, said that since the AHA owns the land, members will come up with a plan to partner with project developers to build a new structure on the site in future. Along with the AHA, Integral Property Management served as one of the primary companies involved in the decision to demolish the Roosevelt House. “The demolition of the Roosevelt House took about a year in planning. We’ve been working here for five months. There will be a new project on this land decided by the Atlanta Housing Authority,” said Barry Roberts from Atlanta Demolition. The company used approximately 150 pounds of explosives to bring down the Roosevelt House. According to them, the building was first weakened and then allowed to fall. Holes were cut into the side of the building and extra explosives were added to ensure that it fell away from the nearby NAA. North Avenue and Centennial Olympic Park Drive were closed to pedestrian and vehicular traffic from 7-8 a.m. but there were still a number of people who watched the implosion from Techwood Drive. The building site clean-up will take at least a month to complete. Atlanta was the first city in the United States to construct buildings for the underprivileged and disabled in the 1930s, replacing slums by widespread housing projects like the Roosevelt House and Palmer House. In 1994, city authorities decided to replace them with modern mixed-income projects. The Roosevelt House was built in 1973 and contained 150 apartments, but it had been vacant for the past two years. The building was named after President Franklin D. Roosevelt, who founded the national public housing policy along with Atlanta developer Charles Palmer. It was the second last public housing project slated for demolition in the city. The Palmer House, which is the last remaining public housing project, will not be imploded, but it will be demolished floor by floor over the next three months since an implosion would be dangerous to surrounding establishments. “The infrastructure of these buildings was old and crumbling. Now we have an opportunity to build something more up to date with no challenges posed by the infrastructure. Demolition is the only way to build new structures,” Henderson said.